+ Rick Steves is absolutely right. If you want to be in the Alps, get up there and stay in a village high above the valley. So we didn't stay in Interlaken like we did in 2004. 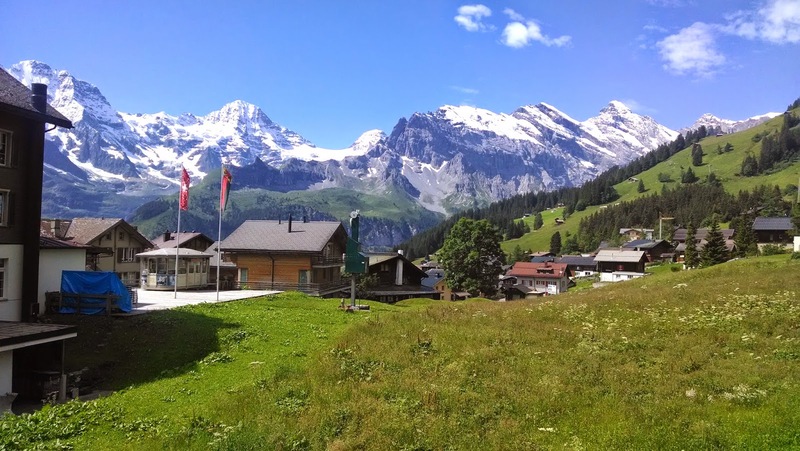 This time we got it right and stayed in Mürren which tourists can reach only by gondola and train. What a joy it was to stay in a beautiful mountain village without any traffic. + Rick Steves offers a great short video about the Schilthorn (the peak above Mürren reached by the Schilthornbahn gondola) and the great hiking in the area. Rick's book on Switzerland is loaded with Berner Oberland information and ideas. We stayed at the Grande Fjord Hotel in June 2006. Unforgetable. I took this photo. Click on the image for the hotel website. LONDON TO PARIS: FLY OR EUROSTAR? ABUNDANCETREK TRAVEL BLOG 2008 at YAHOO!